You can significantly reduce chances of running into trouble by ensuring the boat is seaworthy, routinely checking and maintaining systems while at sea, having a sound understanding of the ocean and your boat, and being organized. The ocean is unpredictable, however, and even the best of seamen can run into trouble. To maximize your safety it is important to have the necessary safety equipment. Extensive First Aid Kit: This should include all the basics plus a range of heavy duty antibiotics, anti-seasickness medication, strong painkillers, sun burn creams, laxatives (plentiful supply) and suturing supplies. Flares: An extensive arsenal of flares is essential. Red smoke flares are used as a daytime distress signal, and bright red magnesium displays are used for night time. These flares can be hand held or propelled aloft with rockets and parachutes to slow their descent. White flares are used as last resort communication to alert other ships they are on a collision course. Minimum required number of flares is; 4 red rocket, 4 red handheld, 4 white rocket, 6 white handheld, and 2 smoke. Remember, this is the minimum recommended – the more the merrier. Fire Extinguisher: Fires can be the worst kind of disaster at sea. If crew is forced to abandon ship before retrieving emergency equipment, death is all but assured. Fire fighting starts with prevention. Exercise caution and prudence around the stove and fuel, smoke carefully, and make sure your electrical system is sound. A one kg dry powder fire extinguishers should be mounted in a very accessible location. Additionally, buckets make very good fire extinguishers. If a fire occurs, one person should immediately be readying emergency equipment while the other fights the fire. Grab Bag: A waterproof bag with basic survival gear should always be ready to toss into the life raft in case of emergency. Ideally this would include flares, a handheld VHF radio, a hand crank desalination unit, fishing gear, knife, GPS, containers of water, high energy food, signaling mirror, whistle, flash light and a pen and notepad. Additionally the EPIRB and satellite telephone (in a waterproof container) should be ready to be a prioritized in the transfer. Harnesses: Safety harnesses and connecting lines are your umbilical cord to the boat if you are washed over the side. Most marine stores sell quality harnesses. Connecting lines should be fitted with karabiners so they can easily be clipped onto the lifelines (cables running along the sides of the deck), or jackstays. Life Jackets: A life jacket should be carried for each person. Four person offshore life raft. 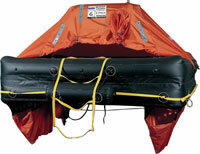 Life Raft: A lightweight life raft is a good idea. They are quite pricy ($5000 and up), but can also be rented. Liferaftrental.com is a good place to rent from. Life raft stowage is problematic in a rowboat. On-deck mounting will usually be in the way of one of the rowing stations. It should not be stored in a difficult-to-access locker either. Ideally it should be small enough to fit comfortably in the main cabin where it can easily be manually deployed. In a calm harbour a brightly painted ocean rowboat seems hard to miss. In the open ocean amongst big waves, they can be almost invisible from the bridge of a freighter. There are a number of devices that will make you more visible to passing ships.Radar: Radar works by emitting radio waves and detecting any that are returned by way of reflection. Reflected radio waves indicate the presence of an object. Large ships almost always have radar units which are used for detecting the presence of other boats, land, or other objects protruding above the water. Metal boats have much better reflective characteristics than wood or fiberglass, and create a much stronger signal. Large waves can also reflect radar signals, which will create a blip on the screen that can be confused with a boat. To accommodate for large waves the radar can be adjusted to display only objects above the maximum wave height.Unfortunately, due to the fact that a rowboat is generally made of wood, and seldom emerges higher than the maximum wave height; it is virtually invisible on a ship’s radar.It is impractical to have a radar unit in a rowboat. Passive Radar Reflector: It is possible to increase reflection of radar radio waves using a passive radar reflector. A radar reflector is a device made from sheet metal with multiple reflective faces. The radar signal emitted from large ships bounces off the reflector, which will register as an object. Radar reflectors work well when they can be raised high above the ocean’s surface such as on a sailboat’s mast. Unfortunately rowboats do not have any high points to mount the reflector, so they are not very effective. They should be mounted as high as possible. Cost is $30-$80. Active Radar Reflector: Active radar reflectors are electrical devices that can detect and replicate the radar signal being broadcast from passing ships. The ship’s radar reads this signal as a strong reflection and your boat will register as a significant blip on their screen. Active radar reflectors will also alert you to the presence of radar-emitting ships. They are not cheap (retailing for about $800), but are strongly recommended. EPIRBs are the standard recommended emergency beacon by Coast Guard organizations worldwide and their use is encouraged for all ocean voyages. ARGOS units are not Coast Guard recommended, although their supplemental use is beneficial in some instances. EPIRB: An EPIRB is a beacon that uses satellites to relay a distress signal to the authorities. The satellites can also pinpoint where the signal is coming from. Some EPIRBs have a built in GPS and will act as a transponder by relaying your coordinates. Before departing on a voyage, EPIRBS should be registered along with the voyage particulars. Spot: The Spot Satellite Messenger relays your coordinates to overhead satellites, and your progress is automatically tracked on Google maps. Additionally, in emergencies this device can transmit your coordinates and a distress message to ten email addresses or phone numbers. The best thing about the Spot is its price. The unit costs $150, plus a subscription fee of $100/year for unlimited use. Argos: An ARGOS is a transponder that regularly broadcasts your coordinates to a land-based station which allows your progress to be tracked. This technology is now obsolete, as there are much cheaper and more efficient alternatives such as the Spot.